Cava is a Spanish wine that is very similar to French Champagne, but it is not always known by his name outside Spain. Spanish Cava is often confused with champagne. A certain similarity exists, but Cava it is not a Spanish copy of French champagne, it's CAVA, in capital letters. Cava has an own name and its own character. Cava – The sparkling wine produced in Catalonia is very similar to French Champagne and sold 228 million bottles in 2008, 1.38% more than the previous year. The history of Cava starts in the mid-nineteenth century during a period when wine production in Catalonia experienced a fantastic time and champagne triumphed in Europe. The Cava was born in the Catalan Region San Sadurní d'Anoia when several families started to experiment with local grape varieties and as the result was Cava wines, with its peculiar character. 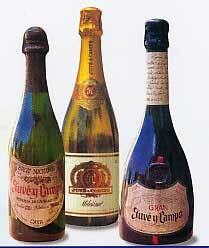 The big success came during the 60 - and 80's, when Cava became known worldwide with its own name. The Spanish Cava wine is different from the French champagne in many ways. Of course the taste is a result of the different grape varieties used, but also the bubbles in Cava are different from the champagne. Cava has softer bubbles than the champagne, making the Cava wine perfect for much more than a toast. A whole meal can be served with Catalan cava in the glass in difference to the French Champagne that is suitable only for special celebrations and a toast. The Spanish cava is a nice sparkling and luxury wine matching all dishes you would serve with any kind of white wine: It is easy to impress your guests with the festive bubbles of Spanish Cava together with aperitifs, tapas, salads, chicken, fish, shellfish or seafood. Remember to keep it cool! For desserts the delicious Cava wine has no limits. Chocolate with Cava is a delicacy as well as the luxury and almost sinful combination of Cava and Strawberries. Cava is also unbeatable as an ingredient in various recipes, both in sauces and desserts. It is no wonder that more than two hundred million Spanish Cava bottles are produced and sold annually. The area where the Spanish Cava is produced enjoys a mild Mediterranean climate throughout the year, mainly in the wine region Catalonia in north eastern Spain. A small part of the Spanish Cava wines are produced in Rioja, Valencia, Badajoz and Aragon. The most traditional cava town: San Sadurní d'Anoia is the largest producer of cava in Spain with a remarkable 75 percent of total Spanish Cava production. The Spanish Cava wines are produced with natural fermentation methods: When the wine is bottled a special technique is applied to produce a controlled fermentation. After a while the cava bottles are opened and partially emptied and then filled again. The method was discovered with the microbiological studies that Louis Pasteur used to create the fermentation of the grapes that later resulted in the creation of the French Champagne. The grape varieties used to produce the Spanish Cava are: Macabeo, Xarello, Parellada, Chardonnay, Garnacha and Monastrell.